I have been a bit absent. Every spare moment from work, or bit of energy left at the end of a day, I have been trying to give to the horses. Things are feeling good on that front, but I will spare the details for fear of jinxing it (I have just a touch of superstition in my bones). However, I have an amusing interaction from last night to share … and a rare moment of quiet in which to do it. Old man Java is starting to show his age, so Noble has been getting to spend time with “uncle” Coffee these days. The dynamic between Java and Noble had begun to tilt in Noble’s favor – but Coffee is having none of that! They are of equal size, at the moment, but Noble will be much larger in no time. Coffee is taking this opportunity to set his position with the young ‘un! What happened last night was just further proof, in my mind. The large turnout has a gate at each end. Since Coffee uses every opportunity to put Noble in his place, we have been using both gates when we let them go, or catch them – me and Noble at the lower gate, mom and Coffee at the upper gate. This ensures no jostling, and makes things easier for us. It only took once for Coffee to realize that he had to go to the upper gate to get his halter and come in for his meal. Noble just goes to wherever “mommy” is. 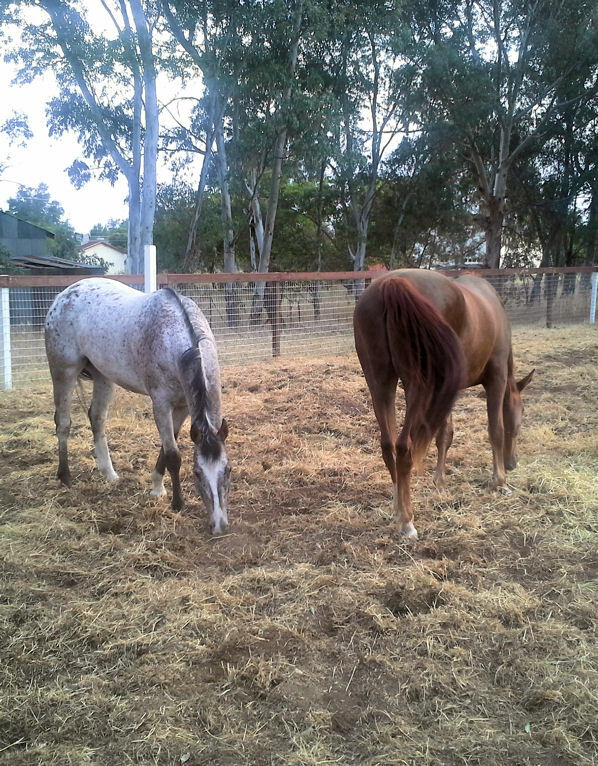 Last night, both horses happened to be near the lower gate when we went to get them. Coffee watched as my mother went by, started to turn to follow, then stopped. I could see the wheels turning as he started to look around. My mom called him, and ears flicked … then he made his move. 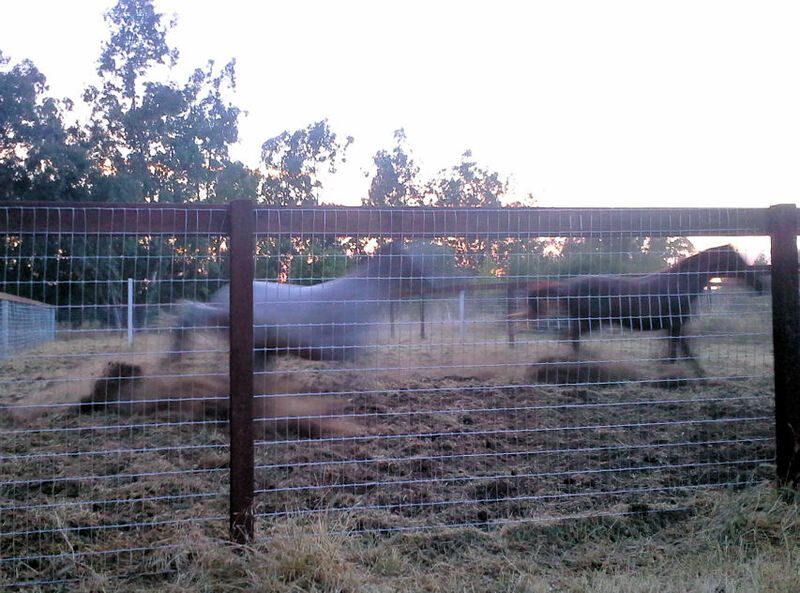 He whirled around and chased Noble away from the gate where I was waiting. 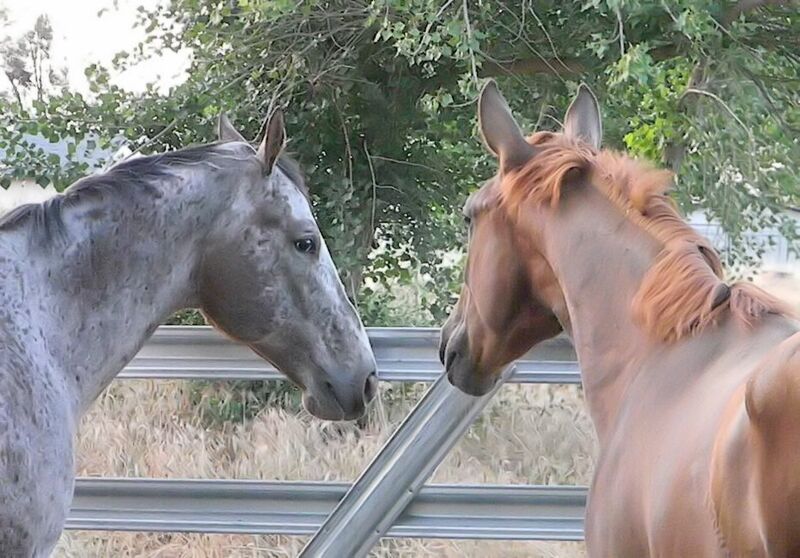 He chased Noble up the pasture, until they both ended up at the far gate. Okay, so far just high spirits, right? It was what he did next that showed real purpose to his maneuvers. My mom had Coffee’s halter ready and was about to place it when Coffee looked over at Noble whose head was also offered. This, apparently, would not do at all! Coffee turned and chased Noble again – this time into the middle of the turnout. My mom called him again – “Coffee! Come back here!” Coffee looked around … at me on the lower gate; at Noble, now frozen and waiting for the next “attack”; at my mother on the upper gate. Seemingly satisfied that all was right, he turned and briskly trotted back to my mom! Now, think about this. Coffee sees himself as “big man” in the turnout – but, because we use the lower gate, Noble is always first in and first out. You can interpret what happened in any way that you want, but this is how I read it: Coffee was tired of Noble getting to be first, so he made sure that he maneuvered the kid into a position that would ensure Coffee got out first. And it worked, too! Once Coffee left him, Noble dutifully came when his “mommy” called – but by then Coffee was already caught and through the gate. Of course, someone I once argued with on Facebook would tell me that I can’t know this without a valid scientific study. Nonsense! Science is just now discovering things about horses that I have learned through more than forty years of living with them. I have struggled my entire life with scientific assertions that animals have no complex thought or emotions, and I now take great “I told you so!” glee in finding out I was right all along. So, I choose to believe that Coffee is a manipulative little punk … but a lovable one! This entry was posted in Just For Fun, My Journey and tagged Coffee, equine behavior, Noble, pushy, science, silly horses, turnout. Bookmark the permalink.